M. Cuneyt Ozmen presents a case involving an unusual foreign body following bombings in Syria. 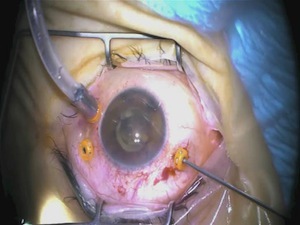 After removing the object through a large limbal incision, the object is discovered to be a piece of a plastic playing card 14 mm in diameter. Vitrectomy is completed from a small clear corneal opening with the help of a noncontact, wide-angle viewing system (EIBOS). Nice job. Nothing like trying to fix an RD through a 2 mm clear window, huh? Thanks for posting the video. Wow. Cannot believe the retina view through that cornea. Great job.